I have said and proved why blogging is best way to make money online. I have already shared about the most common blogging mistakes that every newbie blogger do in their blogging career. 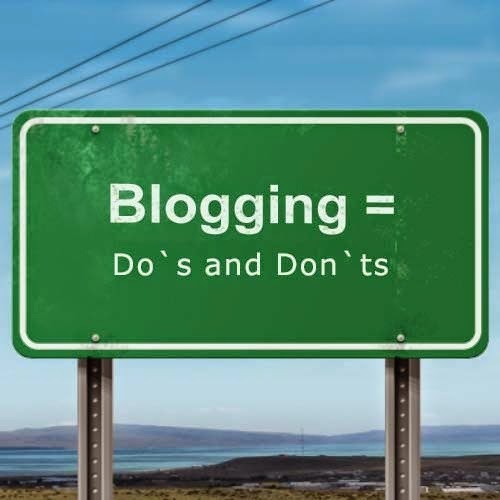 Today I am sharing what my blogger friends thinks and suggest about Blogging Do`s and Don`ts. Do be Authentic, Don't Give up! When you're blogging, whether for yourself, a company, or as a guest blogger. One of the most important thing is to be original and authentic. You want to provide your readers or potential readers with genuine ideas and information. Sure, there might be many blogs on a specific topic, but it's about writing on that topic with your own ideas and thoughts about it. There are times where traffic might be low and you may not be generating the results you're getting. That's why you need to keep improving and looking at what you may be doing wrong. Write lengthy emails that "sells yourself"
Finally, don't neglect the importance of outreaching to the community! Participate in Tweet chats and don't be afraid to ask questions to your industry's community. I think it's the rare few who make a good living off of blogging within the first few months. Unless you can come up with a completely unique twist on a subject and get it noticed by the right people, it takes years to begin making real money off of blogging. Or unless you're an already established writer w/ a large following. Social media definitely helps get views up and joining as many platforms as you can and using them to their utmost potential is key. For example, if you write a blog on a certain subject, don't just put a link on your wall. Find other Facebook pages that are about the subject and provide links there. People who are interested in that subject will probably click on your blog and give it a read. There are also services like OutBrain that will publicize links on other high-traffic pages. You have to pay, but I'm not sure how it works exactly - whether it's a monthly fee or pay-per-click. I haven't done much research into it because I don't have the extra money at this point. But something else is very important. I'm asking a question, not trying to criticize. English isn't you first language, is it? The grammar in your brainstorm is pretty bad and that's not good for a blog. People will cease reading after the first glaring grammatical error and won't come back. Publicity may be the way to get people to your blog, but keeping them there relies on style and readability. In my experience people fail because they try to take rather than give. They copy others rather than being unique. They put up a site with zero useful and unique content, slap up a few adsense ads and affiliate links and expect people to click on them. It's never going to happen. To succeed bloggers need to find a group of people to serve, rather than rob; a group of people whose values are aligned with their own and who need help in areas in which you are an expert. Expertise comes from walking the walk and doing things yourself and NEVER from reading real experts and paraphrasing what they write. To succeed takes at least 2 years of GIVING and building a community. Not many people are prepared to put in that much time and effort, so the majority of would-be bloggers will always fail. There's a difference between being a writer and a blogger. Writer's produce content while blogging entails much more. It demands that you manage your platform and create an optimal user experience, drive traffic and build a community. That requires high quality content that is flavored by authenticity. Authenticity comes by having a unique voice, viewing issues from unique angles and breathing new life into issues that may have already been previously canvassed over and over by others, by sharing a new perspective or deeper analysis on the issue. Too many bloggers focus on merely keeping up to their content schedule with little focus on authenticity. With over 2.73 million blog posts being written and published daily, how will you ensure that yours becomes the blog of choice. That's the trillion dollar question which every aspiring blogger has to answer. It is hard to produce content week after week. I find that I am much more consistent if I have a system in place. I keep blogging ideas on Trello.com to "prime the pump," and a paper editorial calendar to schedule postings. That way I know what's coming up and can plan out what I'm publishing. I do my best to publish my posts on Mondays and Thursdays. This is scheduled in my time manager along with reminder write the post the day before.Every blogger should have an editorial calendar whether it is paper or online along with a system to support their publishing consistently. I think one of the biggest reasons bloggers fail is that they spend too much time building an empire that they do not own. What I mean is that bloggers spend a lot of time and even money building up a following on a platform, like Facebook or Pinterest. They nurture that audience until it is exactly what they want it to be... but then something changes. Facebook starts serving your posts to less people (embracing a pay for play model) or Pinterest starts injecting people's walls with sponsored pins. Suddenly, things just aren't working as well as they used to, and your income plummets, along with your motivation. In order to truly own their audience, bloggers must have a direct line of contact, and that means an email address. Only by building up an email list, full of interested and invested opt-ins, can a blogger truly own their audience. Do find your own voice - that tone and style that connects you well to your readers. More than frequency or word length, your connection with your readers is what counts. Of course, that means your ideas or your way of expressing them needs to be unique. If you just repeat the same information the same way as it's found all over the Internet, you are unlikely to build a close connection with your readers. If you say something unique, something different, something that makes readers nod their heads or say "Aha! ", then you win. Don't sweat the metrics. How many words should your post be? How frequently should you blog? How many times should a keyword show up? These are the things that squelch your voice. Use exactly the number of words you need to communicate your message (as I rant a bit at http://thgmwriters.com/blog/how-long-blog-post/ ). Blog as frequently as you have something useful and helpful to say. Include the keyword when it makes sesne to do so. The metric will drive you crazy and possibly drive your readers crazy, too. Don't sweat them. Great question, this could be a very wide topic so I'm going to narrow it down. The below is based on my experience and the mistakes I made from my blogging journey the past 1.5 years. I think the major reason people fail is because they don't start with a clear goal--is blogging a hobby or a money making venture? If it's a hobby, then no need to be upset that it's not making money. The very definition of a hobby is that it brings you enjoyment/entertainment. People expect hobbies to be an expense rather than a revenue. The day you don't enjoy it anymore, stop and switch to another hobby. If it's a money making venture, then map up exactly what your monetization strategy will be before you start doing anything. Then work backwards from there. A "throw everything at the wall and see what sticks" strategy won't work and will only waste time and demoralize you. And set a deadline eg if you don't get $x by x months, stop and switch to another business venture. Screwed businessmen don't throw good money after bad money. Treat it like a business and look at the numbers. The problem comes when people mix the two up. They end up in a conundrum where they don't know whether to stop or continue when they don't get results after investing time, effort and money. The decision criteria becomes muddled. Should one based it on numbers or interest? To avoid this, decide upfront whether the goal is fun or to make money. Hope this helps. We always need advice from professionals and I hope this advice help you in blogging. These are the few suggestion from my fellow bloggers on Blogging Do`s and Don`ts. I think the biggest mistake is trying to make money from a blog and not treating it accordingly. There's a huge difference between hobby blogs and business blogs, and then there are blogs that are the business. You need to understand the difference before making one single post. My number 1 top for blogging is simple: Add value first! Think of the last blog article that you read, and liked, and even shared. Was it just a long paragraph with empty words? Or was it something that you could relate with, something that added value to you as a person? The first thing you should ask yourself if you should decide to start blogging is... what value will this add to my readers? If they find your content valuable, guess what happens? They share it with their friends and so on and that brings traffic back to your blog which you can then monetize on the long run. If blogging is important to you, do find the time to blog, whether it means getting up early to do it, doing it at night, or doing it during times you would have spent doign other things, like watching TV. Blogging is the most talked topic and still people do not understand it well. I hope this blogging guide for money will help you to understand it more better way. If you have any question or suggestion feel free to share via comments. Don`t forget to like us on fb and subscribe our newsletter to get free updates.